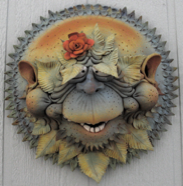 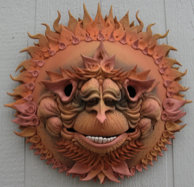 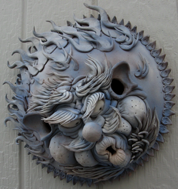 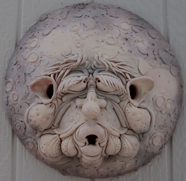 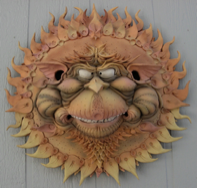 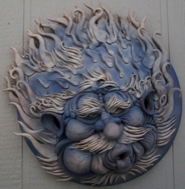 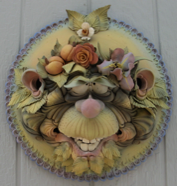 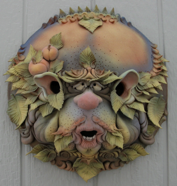 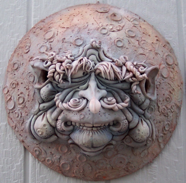 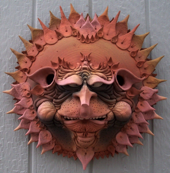 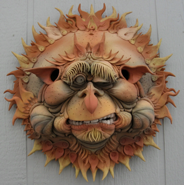 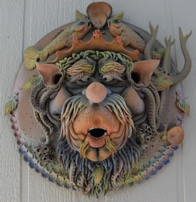 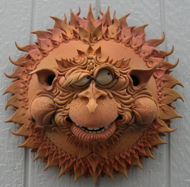 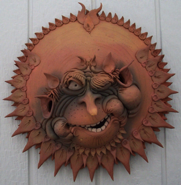 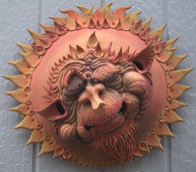 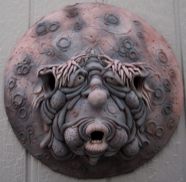 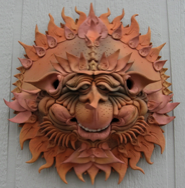 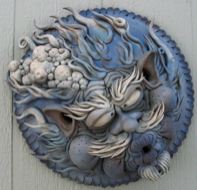 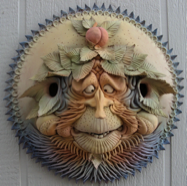 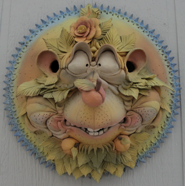 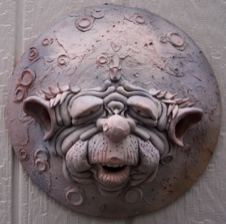 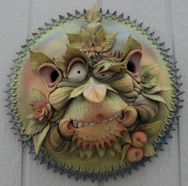 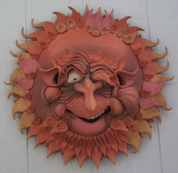 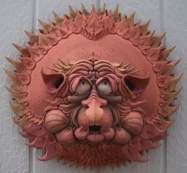 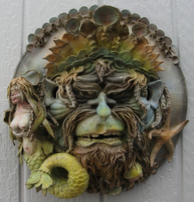 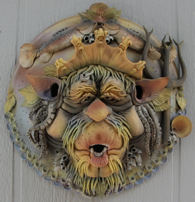 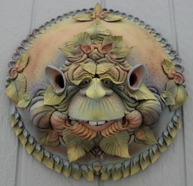 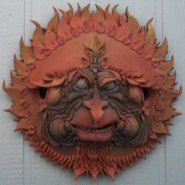 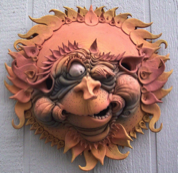 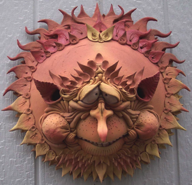 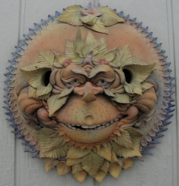 Here are a few examples of my own version of the classic sun face to enhance your garden walls. 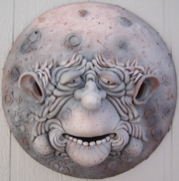 Named "Goons" because of their ever-changing humorous character and expression, each sun goon, garden goon, and moon goon is unique and sure to elicit a chuckle or smile from your family and guests. 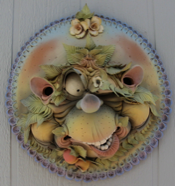 All types of Goons are made from the same clay and fired in the same manner as my Bird Garglers™. 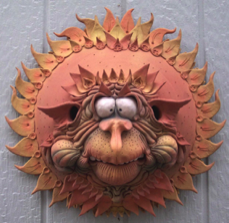 Unglazed or glazed, Goons share the same qualities of durability as Garglers™. 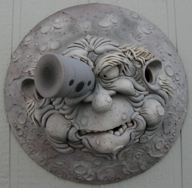 Installation is easy; simply hang the goon on the notched rim on the back from one or two large-headed nails, screws, or bolts. 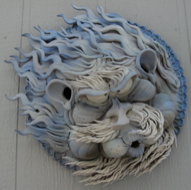 The ear holes function for carrying, handling, and ease of installation. 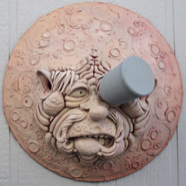 Goons are available in two sizes. 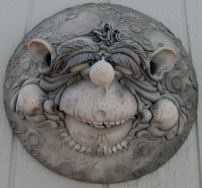 Large size is approximately 21" in diameter, whereas the small size is approximately 18" in diameter. 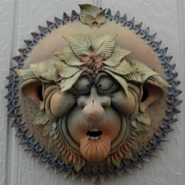 Goons make great accents on patio decks, arbors, or potting shed walls, in "garden rooms," gazebos, or around hot tub and sauna privacy screens. 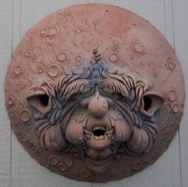 Once again, the images below are only examples of past goons; new ones are always a possibility. 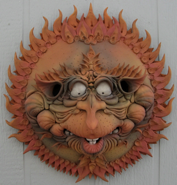 Shipping charges are UPS rates.